The Hub House Diner, Dulwich Hill. When we hear the words ‘American Diner’ we already have an image in our head of the types of food we will be served. We imagine burgers, ribs, fries and shakes, and that’s exactly the theme behind The Hub House Diner. Located on New Canterbury Road, Dulwich Hill it is not only easy to find, it also has access to parking off Seaview Street which makes having breakfast, lunch or dinner here worth the trip. The décor is a combination of rustic, industrial and modern all rolled into one room. 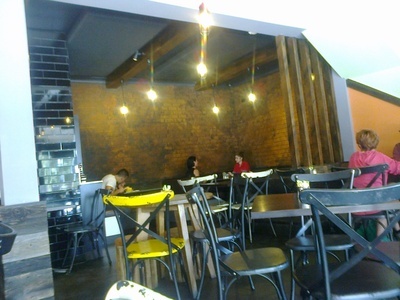 The tables and chairs have a rustic appeal, while the back booth style seating has brick work and low hanging lights, giving it an industrial feel. Add a few walls of black shiny tiles and a few splashes of colour, and you have a mixture of different looks. In saying that, it all works and is quite appealing. The staff were very friendly, and even though we had arrived slightly earlier than the lunch start, they were happy to take our order. Breakfast is served until 12pm. The choices for breakfast ranges from preserves on toast ($6.50) to poached fruits ($8.50) or toasted banana bread with ricotta, roasted nuts and honey ($8). If you are looking for something a bit more filling, there is always eggs on toast ($9.50) or French toast with rhubarb, crème fraiche and maple syrup ($16). There is also an all day breakfast option until 4pm of Bacon and egg roll ($11) and Tasi eggs. A combination of scrambled eggs and Tasmanian smoked salmon on toast ($13). We however were there for lunch, and the menu had a lot to offer and was available until 5pm. One of the girls I was with chose the zucchini fritters ($14). Three zucchini balls perfectly cooked laid on top of sour cream, and a serving of hot sauce. Another friend chose the soft shell tacos ($15). Even though the menu said soft shell, we had an image of the original style taco shells. Instead it came wrapped in what looked more like a tortilla wrap. Inside it was full of lovely mixture of pork, lettuce, sour cream, and black bean. With a choice of beef, chicken and vegetarian burgers, I went for the Hub Char grilled Chicken Burger ($17). Depending on your taste you may prefer a smoked salmon sandwich ($15), a steak sandwich ($17) or a Caesar salad ($14). The presentation of the burger and fries on a wooden serving platter was so simple, and yet it suddenly transformed this meal into something more than just a burger and fries. We actually sat and stared at it for a while just to admire it before I devoured it. Perfectly grilled chicken with an abundance of lettuce, melted gruyere cheese, and the most delicious tasting old bay aioli, all inside a fresh bun. The Hub House Diner is also fully licensed with a variety of beverages available. Being midday, a Lemon Lime and Bitters ($5) was the perfect choice. This was not your usual tasting Lemon, Lime and Bitters. It had more of a raspberry lemonade flavour to it. Even the colour was different. It was sweet and really refreshing. There was also a kids menu which included chicken tacos ($10), fish fingers ($11) and for something sweet, vanilla ice cream with a choice of flavoured toppings ($5). If you are looking for something sweet, the menu offers the following. Banana bread ($8), Eton mess, meringue, fruit, whipped cream, raspberry coulis, lemon curd with homemade marshmallow ($10) and chocolate sorbet ($7). There is also a cake display with fresh pastries available. The Hub House Diner is a great place to dine for all the family. With something for everyone’s taste, leave the pots and pans at home and let these guys cook you a great meal. Why: Great for families and value for money. Hi Justine and Amelia, that was just me who posted a comment saying that I will be sure to try the Perri Perri chicken burger next time I go to The Hub House and much like Amelia I really did like this place. Will definitely return for another visit. To the person who e-mailed in their comment, in response to Amelia's comment below - can you please kindly re-submit? Somehow a bug occurred, dis-enabling me to publish the comment earlier - of which is now resolved. The Perri Perri chicken burger is also a must! Love love love this place!